Bacteria are found nearly everywhere, including in most foods. Bacteria double in number every 10 to 30 minutes when exposed to ideal temperatures, pH, nutrients or moisture levels. Controlling temperature is a way to prevent bacteria from growing and possibly causing food-borne illness. Cooks should not depend on their instincts, cooking time, oven temperature or product appearance to determine when a product is done: thermometers are important tools for protecting foods. Several types of thermometers are available for use with foods. Choose thermometers approved by the National Sanitation Foundation (NSF). They are usually available in restaurant supply businesses and some kitchen specialty stores. Be sure the thermometer can be calibrated for accuracy; check the package label for calibration directions. An inaccurate thermometer could be worse than no thermometer. Glass mercury-filled thermometers should never be used for taking food temperatures because they could break. These thermometers should only be used for taking temperatures of people. 1. Bimetal stemmed (or bayonet-style) thermometers have a dial scale with a plastic lens cover and a temp-erature range from 0 to 220 degrees Fahrenheit (-18 to 105 C). Their stems should be at least 5 inches long. They should have a calibration nut under the dial. They can accurately measure the temperature of relatively thick or deep foods (more than 2 inches) such as beef roasts and foods in stock pots. 2. Refrigerator-freezer thermometers may be built-in, hanging or sitting types. They should be checked for accuracy using a calibrated stemmed thermometer: place the thermometers side by side in the refrigerator or freezer and com-pare readings. Inaccurate refrigerator-freezer thermometers usu-ally cannot be recalibrated and must be replaced. 3. Digital thermometers show temperatures quickly on an easy-to-read display. They are available in several sizes and styles, some with inter-changeable temperature probes. Some models can be calibrated. Change batteries based on use or according to indicator light. 4. Candy, meat, microwave and deep-fry thermometers are, as their names suggest, designed for special uses. Thermometers can get out of adjustment if they are jarred. Any time thermometers are dropped or exposed to extremes in temperatures, they should be calibrated. All thermometers—regardless of use—should be calibrated at least once a month to maintain their accuracy. Two acceptable methods for calibration are the Ice Point Method, which is recommended for high altitudes, and the Boiling Point Method. 1. Make a thick ice slush using crushed ice and cold water (50/50). Remove thermometer from its case and insert sensing area of thermometer into the center of the ice slush to a depth of at least two inches, avoiding the sides and bottom of the container. 2. Allow indicator to stabilize. 3. Adjust calibration nut so indicator reads 32 F (0 C). 1. Insert sensing area of thermometer into boiling water avoiding sides and bottom of pan. 3. Adjust calibration nut so indicator reads 212 F (100 C). To adjust for high altitudes, decrease setting 1 F (0.6 C) for each 550 feet above sea level. • Remove the protective case on stemmed thermometers. • Wash thermometers in hot soapy water, rinse with clean hot water, sanitize with a solution of one tablespoon chlorine bleach per gallon of clean lukewarm (at least 75 F) water, and air-dry before, between and after uses. Keep the protective case clean, especially inside the case. • Place thermometer in the center of the dish or in the thickest part of meat away from bone, inserting to the “dimple” or a minimum of two inches on the stem of the thermometer. • Take the temperature reading when the needle on the dial has stopped moving for 15 seconds or the digital scale stabilizes. • Take the temperature of the food in several places to confirm thorough cooking. • Do not leave thermometers with plastic lens covers in foods during cooking. 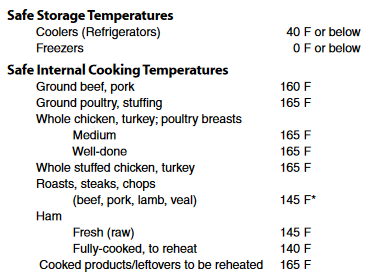 Use a meat thermometer or other thermometer that can withstand the heat of the oven. The Danger Zone refers to the temperature range from 40 to 140 degrees Fahrenheit, which provides ideal growth conditions for bacteria. Food should not be in the DANGER ZONE for more than two hours. Cool foods to 40 F in four hours or less. *Allow the meat to rest for three minutes. For reasons of personal preference, consumers may choose to cook meat to higher temperatures. Note: Measure the temperature of microwave-cooked foods in several places. Stir and rotate foods during cooking and allow to stand two minutes after cooking to allow for even distribution of heat. Source: the gateway to food safety information provided by government agencies.